Discussion in 'D&D 3.X Edition' started by Dysturbed, Dec 9, 2010. Im assuming all i would need to do is change some skills and obviously enter all the weapons and such in but otherwise is it pretty compatible. Say if we wanted to add a mutation section to the character sheet or something does it let you do that? My group usually plays a post apocalyptic game mixed with zombies and radiation exposure caused mutation. It's pretty messed up and it requires a lot of customizing of the system from several different manuals. We even are looking at Exodus RPG but it's pretty limited in comparison to what we where doing before. I just want to be sure before I buy d20 pro that it's going to do what we want it to do. d20Pro is compatible with d20 Modern, however, to date no one has posted corresponding data sets for d20Pro using the d20 Modern ruleset (forum post request). No worries though, this can be accomplished! Long Answer - "How to Guide"
The first step to create compatibly is make a folder in the "C:\Program Files (x86)\MindGene\d20Pro\judge\campaigns" directory titled "d20 Modern". Then open up d20Pro and select the "d20 Modern" campaign from the drop down menu. 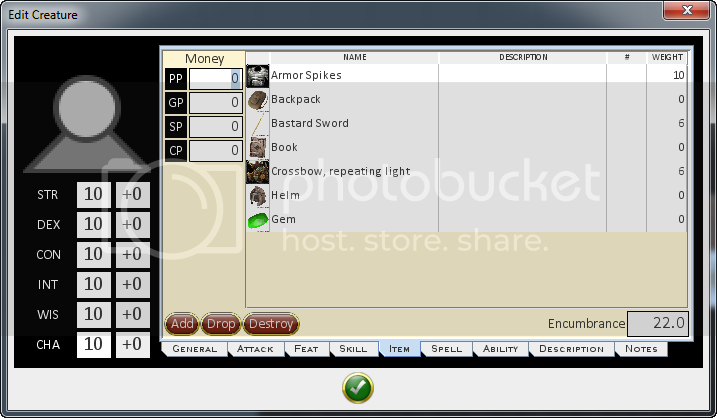 Once d20Pro loads up, it will create some campaign specific folders and files specifically for your new campaign. The next step is to open the folder "C:\Program Files (x86)\MindGene\d20Pro\judge\campaigns\d20 Modern\res\ManuallySpecified". You will notice several empty files in this directory to correspond with your new campaign using d20 Modern rule set. 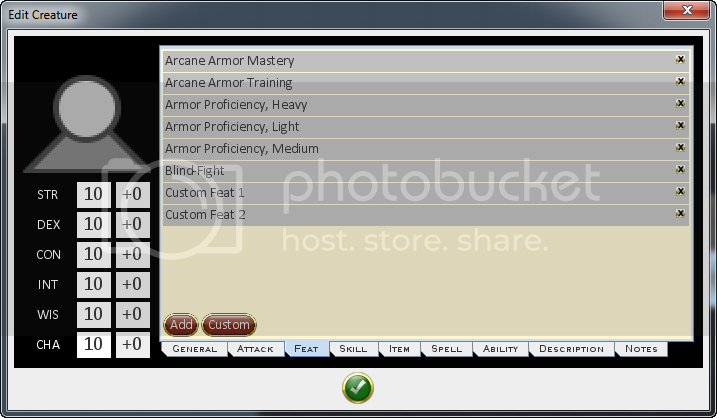 The files we need to worry about editing include: classes, feats, skills and spells. The two ZIP files: stats.zip and status.zip we will copy from the "C:\Program Files (x86)\MindGene\d20Pro\judge\campaigns\D&D 3.5 OGL\res\ManuallySpecified" folder and paste (replace files) to our new campaign folder. Open (If using Windows7 Open Notepad as an administrator then open classes text file) the "classes" text file. Notice: Since a Fighter does not have spells, we can exclude the unnecessary items. The "AttackRate" of 1 indicates that the Fighter's base attack bonus increases by 1 every level. "GoodSaves=Fort" indicates a fast progression of saves associated with Fortitude with slow progression of saves of Reflex and Will saves. You will notice that a Paladin has spells. Thus, under the "Spells Available" section you can see that a Paladin gains access to level 1 through level 4 spells (Spells0= would be if the class has 0th Level Spells, and Spells5= would mean that the class gains access to 5th Level Spells). Each spell is separated by a vertical line "|". You will also notice that a Paladin gains a certain number of spells based on their Paladin Level. Thus, this indicates starting at level 4 a Paladin gains access to level 1 spells only if they have an ability modifier that allows bonus spells (PerDay4= - |0). The number after "PerDay" represents the level of the character; the "-" represents that this class gains no access to 0th Level spells while it is in the first position; and the "0" represents 0 spells for 1st Level Spells (if the ability score allows bonus spells, this will be taken into account). Open (If using Windows7 Open Notepad as an administrator then open classes text file) the "skills" text file. Notice: since d20 Modern does not assign a bonus for Read and Writing any language, you will see a blank spot where an ability is normally located. This indicates there is no bonus while using this skill. Fill in <this> with any language you like. You can even have multiple entries, each with it's own custom language. Open (If using Windows7 Open Notepad as an administrator then open classes text file) the "spells" text file. Open (If using Windows7 Open Notepad as an administrator then open classes text file) the "feats" text file. Notice the InitModifier and Evasion types of feats. InitModifier... improve the inititive roll by the number after the "|", which in this case is +4. Evasion... "|false" = only a successful save will this person take no damage, whereas on a save failure the creature will take full damage. Evasion... "|true" = a successful save the person will take no damage, whereas on a save failure the creature will take half damage. Now all the mechanics of the game is created, we can now create characters based in the d20 Modern world using the custom ruleset you have created! If you still had d20Pro running while creating this new content, simply exit d20Pro and re-open. Your new data is now taken into effect. (Currently the Options > Judge > Refresh Resources does not reload all the new data files - so a restart of the application is required). 5) Identify the creature size (Tiny, Small, Medium, Large, etc) which effects the "size modifier" to determine AC. 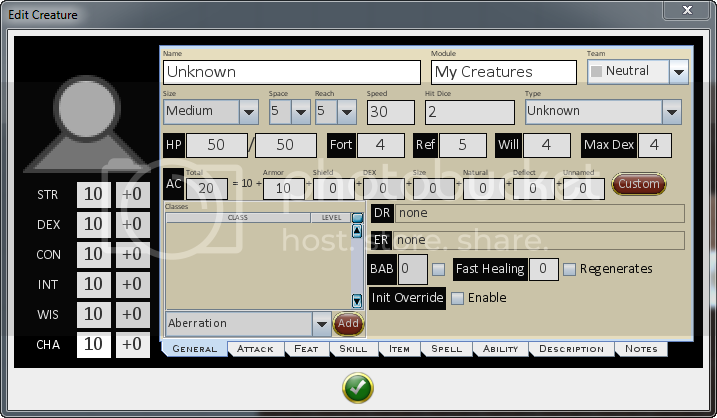 9) Indicate the creature's Hit Dice (Hit Dice) so you can assign appropriate XP (if game warrents). this is for your record only, nothing needs to be in this. 10) Indicate Type of the creature (Type) such as Animal, Construct, Dragon, etc. This is for your record only, nothing needs to be in this. 11) HP Current and Total. Set this once and d20Pro can keep track of current HP while in battle. This is by far the best system I've seen that you can quickly assign damage and healing to creatures, and d20Pro keeps track of it all! 12) Fort, Ref, Will saves. These can be base saves where the creature can roll to pass (3.x ruleset), or can be set as a static for an attack vs save (4.0 ruleset). 13) Max Dex, you can set this to any number based on armor equiped, so that if DEX ability modifier is above the Max Dex setting, the AC will only reflect a bonus up to the Max Dex. 14) Class and Level. To add, simply select a class from the drop-down and press the "Add" button. The "BAB" or Base Attack Bonus will be auto-calculated from the "classes" text document. To add Levels, select from the drop-down menu under the "Level" column. 15) DR. Damage Resistance. When you click on the "none" it brings up a screen where you can check that the character has #/type DR.
16) ER. Elemental Resistance. When you click on the "none" it brings up a screen where you can select the type(s) of Elemental Resistance(s) or Elemental Vulnerablitile(s). 17) Init Override. When selected you can enter the initiative number that you want this creature to be on. If it is not selected, when you go into "Battle Mode" all creatures on the map that is participating in initiative will recieve a randommly generated number (d20 roll + inititive bonus) like normal. 18) And finally, you can enter in all the base stats (STR, DEX, CON, INT, WIS, and CHR) the bonus is auto-calculated for you. Here you can add/delete/copy different attacks. - To Hit - bonus applied to specified attack. - Name - the name you assign to the attack, you can call it "Punch" or "Gun shot" or "Baseball Bat" or "Greatsword" or "Shortbow" or anything else. Note: If the character gets multiple attacks of the same type per round simply copy the attack. 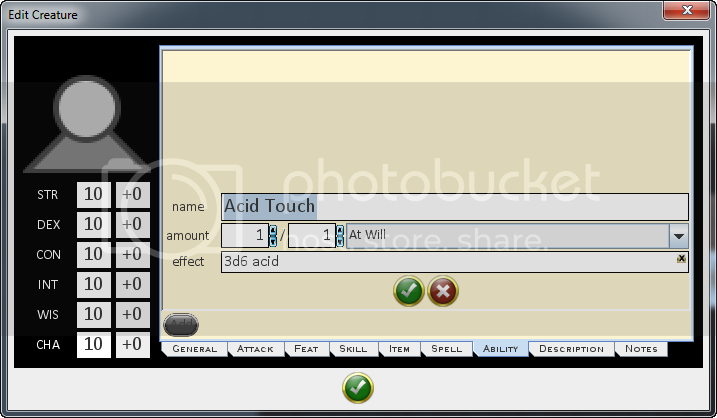 If multiple attacks decreases the attack roll by a number then apply that number to the "To Hit" modifier. So, if the first attack is with a full attack bonus, simply leave it at 0. If the second attack has an attack bonus 5 lower than the first, enter in -5 in the "TO Hit" modifier. And so on. 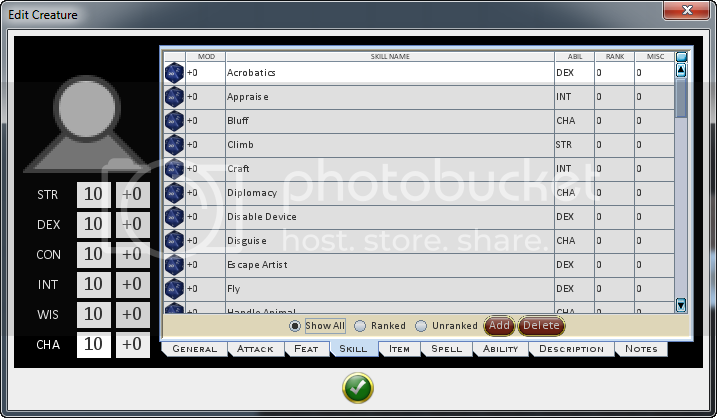 - Crit - you can pick the critical range and multiplyer if the player confirms the critical attack. Currently you can choose a multiplyer from 2-5, or Max. - Type - you can pick the modifier for the attack and damage. Such as STR for a melee attack and STR for damage, or DEX for a ranged attack and none for damage for an attack using a bow, or an attack using INT, and etc. - +6/+1 - Yes, can be a secondary attack (if copies are made of this attack, they will combine so all attacks are made with a single selection). No, single attack only (If copies are made of this attack, they will be all seperate). Here you can add Feats from your feats file, OR add a custom feat and name it. Here you can see a list of all skills from your skills file, add or delete a skill to/from your ranked/unranked skills, and assign ranks and misc modifier to the skills selected (NOte: ability modifier will already be accounted for when the skill is used based on the ability you assign in our skills file. Here you can edit the spell list, or select the "rest" button to bring back access to already casted spells. This list is the availible spells at the time. 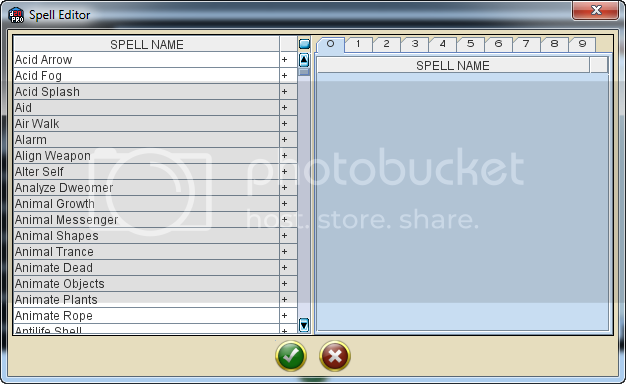 Here you can pick the spells from the spell listing from the spells data text document. Here you can see the abilities the character has, modify a current entry by pressing on the icon before the ability name, or add a new ability. When selecting "Add" this is the screen that comes up. From here you can name the ability, set the amount of uses, and how often the uses reset. In addition, you can pre-define the effect of the ability clicking on the effect "inert" space. The ability you see here already has a defined effect. This will bring up a window with lots of options for how this ability will effect the creature or the creature's adversary. Here you can enter in a description of your character, or any other information you want stored here. Here you can enter in any character notes, perhaps some of the ability descriptions, or some feat descriptions, or some faults, or anything you want. Using D&D Wiki on d20 Modern I was able to quickly create a primer where you can edit/add/delete/modify how you see fit with your own d20 Modern campaign. But at least this will get you started. And you can instantly run a campaign of your own with these files under d20 Modern setting. Thanks for doing these. I'm going to look at updating them with d20 Future, Urban Arcana, and Dark*Matter content as I'm planning on running something for that pretty soon. I'll post the updated files back once I get them done. All this information is great, but how do you address the Action Point Mechanics? I use Action Points occasionally, and when I do I put the number of times in Abilities Tab. Then the Player tells me when they'd like to use it by activating it, then rolling additional die manually (in the d20Pro Game Log through the /roll command or via Core dice, then apply it manually. For most things you'll need to resort to the Core Dice and amend your responses to the players actions accordingly. Tho it is a good idea to have an Ability/Effect that essential can track your Action Points. that way the player can fire that off when using them, thus keeping track of their Action Points. As GM you can just add charges when awarding AP.